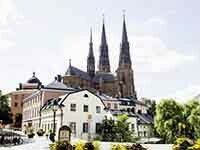 Uppsala is the fourth largest city in Sweden. The city is considered a youth, since here is the oldest university in the country. There are many students here, but the streets are quiet and peaceful. There is also an IKEA store, which was built in 1982 year.